It’s not if but when, And the when took place this Monday morning. A KPC pipeline – that runs through Nairobi’s informal settlement of Mukuru – exploded, taking with it the lives of 95+ people who live, work, school and play near in one of the marginal areas of the sprawling metropolis of Nairobi city. Kenyans have been discussing the pipeline disaster and have been analyzing the factors that led up to the event. On Tuesday, both the Standard and the Daily Nation ran 11 pages of coverage of the event. It’s not surprising that journalists have in the past covered the precarious situation residents of the Sinai village face. There is often coverage of other dangerous conditions Nairobi residents live in – such as those living along the railway or high voltage power line in Kibera, or the polluted river in Mathare, or the dumping site in Dandora. Many are not aware that the Sinai village (referred to in the media as Sinai slum or Lunga Lunga slum) is one village in the larger informal settlement of Mukuru. Mukuru is located in Nairobi’s industrial area. Access to the area is facilitated by roads that lead along the backs of factories and warehouses and industrial workvsites. The dangers of living in Mukuru slum are apparent as factories bellow out smoke, trucks carrying hazardous materials rumble by and pipes and electrical towers dot the landscape. For the past 2 months, the Map Kibera Trust team have been working with youth in Mukuru. The “Map Mukuru” project began with funding from Unhabitat’s Youth Fund and interest from young people in Mukuru who we had worked with in 2010, with funding from HIV Free Generation. The Map Kibera team has been engaged is a long-term process of skills building for young people in Nairobi’s informal settlements of Kibera, Mathare and now Mukuru. The Mukuru project is being run almost entirely by young mappers from Kibera – we’ve taken the opportunity of receiving the youth fund grant to push the Kibera youth to manage the project on their own and to exchange skills and learn from other young people. The team is saddened by the tragic event in Sinai. The event hit some of our mappers quite hard – they were in the field in the area of the blast the previous week and were thankful that we were inside, editing data at the time of the explosion. None of the mappers were injured during the explosion but some lost friends in the fire and we send our condolences to the families and friends of the victims. Our mapping work however is not a reaction to any singular event – it is a long-term effort aimed at amplifying the voices of residents of informal settlements. Our mission is to increase their representation and influence in decision making processes. 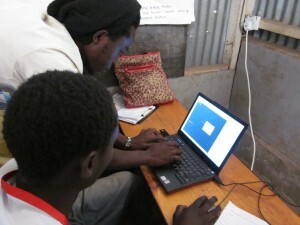 By training young people as mappers and digital storytellers, we hope we are contributing to community resilience, not just to respond to disasters like the Sinai fire tragedy, but to ultimately reduce the risk to resident in informal settlements through identifying solutions to ongoing problems and dangers in the local environment. 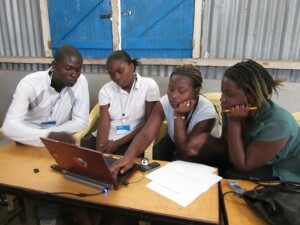 You are currently reading Building community resilience, because it’s not if but when at Map Kibera.